As a New Yorker, I can’t really complain about my inability to travel. First off, because I choose to live in a city where everything is grossly overpriced. But second off, because New York City is a melting pot (or salad bowl, or whatever the current politically correct euphemism is) of different people and cultures. And that means the chance to celebrate them without having to go too far, which can be nice when you’re cooped inside all winter. 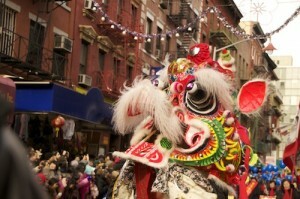 One of the best chances to do that is attending the Chinese New Year parade in New York City. Held every year usually in January or February (it starts on the first day of the first month in the traditional Chinese calendar,) Chinese New Year is a colorful, energetic celebration of winter’s end. China has been on me and my husbands long list of dream vacation destinations, it’s a little far (out of the budget) for us. During that time of year there are affordable hotels in New York that can be booked in advance to avoid the high prices because of the event. 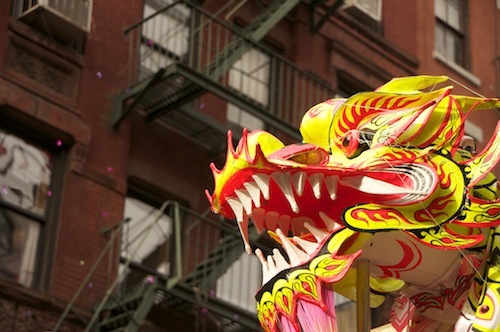 Enter New York’s Chinese New Year parade! Every year we head over to Chinatown toward lower Manhattan bright and early to line up with thousands of others who come to see the parade. I know the parade is a far cry from actually getting to go to China, but maybe not as far as one would think. I absolutely love the parade’s dedication to traditional Chinese culture, and the fact that it’s held through almost every street of Chinatown in Manhattan is an added treat. If you’ve ever been to Chinatown, you know that it didn’t just earn the name from the families hidden away in their homes – it’s lined back to back with stores flaunting Chinese writing, food, keepsakes and more. The culture flourishes here with generation after generation of Americans of Chinese descent or those folks from China themselves. Even just walking around Chinatown on an average, uneventful day can make a person feel like they’ve found themselves in another country. But the day of the parade is a whole other story. I think I read that this year there were over 5,000 people who marched in the parade. There were acrobats, fire-breathers, dancers, marching bands, politicians on elaborate floats, and of course lots of lions and dragons dancing around. It was the year of the dragon this past year, which was really cool. Once the parade gets under way, it’s an explosion of color, energy and joy. I think my favorite part this year was the group of Asian orphans adopted by American parents marching to show their devotion to their adopted children’s native culture. I truly was on the verge of tears watching them proudly march by us! Whether you live in the city and can’t afford to get away, or you’re looking to make a trip to New York and are asking yourself when, consider checking out the Chinese New Year parade next year! The two big tips I’d give as a regular parade attendee – bring some cash to buy the exploding confetti toys they sell for a few bucks all over, and consider making a reservation for a traditional Chinese lunch a few days beforehand. It’s the perfect way to end the day (plus some hot soup on a cold winter day will sound pretty amazing after several hours outside!) but due to the popularity of the event, restaurants can tend to be unusually booked up.